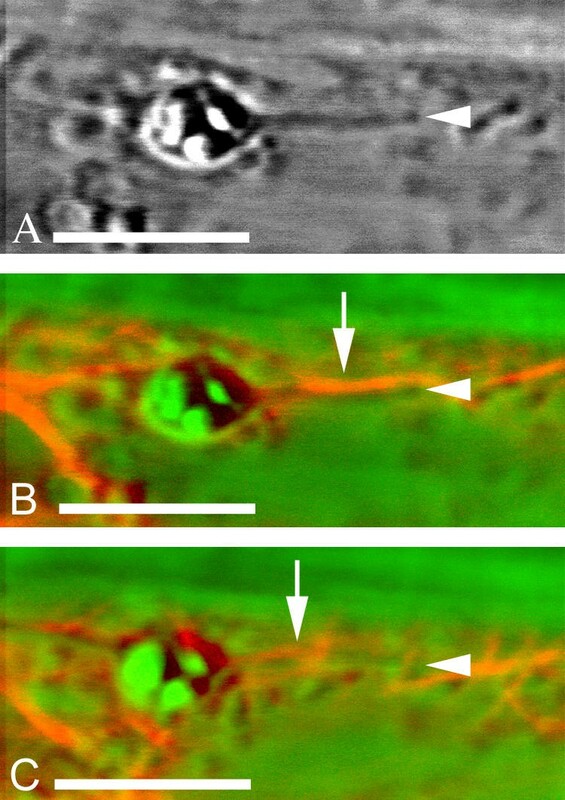 Plastid stromules are stroma-filled tubules that extend from the surface of plastids in higher plants and allow the exchange of protein molecules between plastids. These structures are highly dynamic; stromules change both their shape and position in the cytoplasm very rapidly. Previous studies with microfilament inhibitors indicated that stromule shape and movement are dependent on the actin cytoskeleton. To learn more about the nature of the interactions of stromules and the cytoskeleton, we imaged fluorescently-labeled microfilaments and plastids. We have used Arabidopsis thaliana plants expressing green fluorescent protein fused to the human actin-binding protein talin to observe microfilaments and their relationship to stromules in vivo. Microfilaments were observed in close contact with stromules and plastid bodies of hypocotyl epidermis. Time-lapse confocal microscopy revealed that microfilament rearrangements were associated with changes in plastid and stromule morphology and position. We also observed close interactions between mitochondria and stromules in double-labeled cells. Our results indicate a correlation between the rearrangement of microfilaments and changes in the shape and position of plastids and stromules. Stromules interact with microfilaments that may also be utilized by mitochondria and other organelles. The interaction of microfilaments and plastids is likely to be mediated by actin-binding proteins on the plastid envelope membrane. One of the most remarkable features of plant cell biology is cytoplasmic streaming: the rapid mixing of cytoplasm observed in large vacuolate cells. In many species, chloroplasts participate in this cytoplasmic flow . In addition to random cytoplasmic streaming, chloroplast arrangement within the cell can be altered in response to light intensity and mechanical stimulation [2–5]. Non-green plastids are also highly mobile in certain tissues . Several lines of evidence suggest that plastid motility is actin-dependent. Light-induced chloroplast rearrangements are sensitive to actin microfilament inhibitors in a number of species . Furthermore, several groups have used immunolocalization to show ordered arrangements of microfilaments (MFs) around both non-green plastids and chloroplasts [7–9]. The apparent relationship between plastids and MFs suggests that actin might also have a role in regulating the formation of stromules. Stromules are tubular extensions of the plastid envelope membrane [10, 11]. These structures have been observed connecting plastids within a cell and photobleaching studies have shown that green fluorescent protein (GFP) can move between plastids via stromule connections . Stromule structure is highly dynamic: stromules alter their shape rapidly and have the ability to move quickly through the cell cytoplasm . We are interested in determining how stromule morphology and motility are regulated by the plant cell. Previous experiments with inhibitors of actin and tubulin indicated that MFs are required for the maintenance of stromules as well as their movement . We were therefore interested in determining whether MFs interact directly with stromules. To this end we observed MFs in vivo in Arabidopsis thaliana expressing a fusion protein between GFP and human talin (GFP-hTalin) that specifically labels MFs. Arabidopsis expressing actin-binding proteins fused to GFP have allowed the study of MF dynamics in vivo without many of the limitations of immunolocalization or microinjection [13, 14]. A GFP fusion to mouse Talin was observed to label all previously observed MF structures as well as some novel structures previously unseen with other methods . A GFP-hTalin fusion showed similar specificity for MFs . In this study, GFP-hTalin proved to be very useful for visualizing stromules and their interactions with MFs. We were able to observe stromules in light- and dark-grown tissues in close contact with MFs. The ability to observe plastids and MFs in vivo allowed us to document the relationship between MFs and stromules as they moved within the cytoplasm. GFP-hTalin-labeled MFs and stromules were visualized in hypocotyl epidermal cells of Arabidopsis. We chose hypocotyl epidermis for our observations because these cells contain a high frequency of long, highly mobile stromules. In addition, the relatively flat shape of the cells facilitates imaging of plastids and stromules in the cell cortex. Plastids and stromules are easily identified and imaged with DIC optics in this cell type, so that it was not necessary to generate a line carrying two fluorescent labels. Finally, our previous work in Nicotiana tabacum demonstrating sensitivity of stromule shape and movement to actin inhibitors  had also been conducted in hypocotyl epidermis, indicating this would be an appropriate tissue in which to investigate plastid-MF interactions. GFP-hTalin labels actin microfilaments in hypocotyl epidermis of ArabidopsisConfocal fluorescence images were collected in light-grown seedlings. A) MFs form a network in the cortex of epidermal cells. Image is a maximum projection of 21 optical sections taken at 122 nm intervals along the z-axis. B) MFs form a basket-like structure around a chloroplast in the cell interior. Central image is a single optical section from a stack of 14 images taken at 366 nm intervals. The stack was used to create a three dimensional reconstruction that could be cut into cross sections. Lines labeled XZ and YZ indicate the location of cross sections shown below and to the right of the main image, respectively. GFP-hTalin signal is false-colored green. Chlorophyll fluorescence is false-colored red. In A, DIC image is false-colored blue. Bars: 5 μm. Plastids were often closely bound by MFs. In light-grown hypocotyls, chloroplasts were often surrounded by basket-like structures formed by MFs (Fig. 1B). Plastid stromules were also often bounded by MFs. Figure 2A shows an amyloplast with a thick stromule in a dark-grown hypocotyl epidermal cell. When a fluorescence image of GFP-hTalin-labeled MFs is overlaid on this image, a thick MF can be observed running along the length of one side of the stromule (Fig. 2B, arrow). When viewed at a different confocal plane, the same stromule appears to be wrapped in a network of fine MFs that can be observed crossing over one another (Fig. 2C, arrow). In some instances, MFs appear to define the boundaries of stromules. Figure 3A shows another amyloplast with stromule from etiolated tissues. Fluorescence microscopy reveals MFs running along either side of the stromule in a single optical section (Fig. 3B, arrows). In the same image, the tip of the stromule is also defined by a MF running perpendicular to the long axis of the stromule (arrowhead). MFs were also observed terminating on the surface of stromules (Fig. 3C & 3D). Stromules interact with discrete microfilaments A) DIC image of an amyloplast with a thick stromule in dark-grown hypocotyl epidermis. Stromule tip is marked by an arrowhead in A-C. B) A thick MF bundle makes close contact with the amyloplast stromule from A (arrow). C) In a different focal plane, the same stromule is surrounded by a meshwork of fine MFs (arrow). In B&C, GFP-hTalin fluorescence is false-colored red and a DIC image (identical to the one shown in A) is false-colored blue. Bars: 5 μm. Microfilaments make direct contact with stromules A) DIC image of an amyloplast (p) with a thick stromule in dark-grown hypocotyl epidermis. The tip of the stromule is marked by an arrowhead in A&B. B) MFs run parallel along the sides of the stromule shown in A (arrows) and perpendicular to the stromule at its tip (arrowhead). GFP-hTalin-labeled MFs are false-colored red. The DIC image from A is false-colored green. C) DIC image of a chloroplast with stromule in a light-grown hypocotyl cell. Stromule is marked by an arrowhead in C&D. D) MFs terminate on the surface of the stromule shown in C (arrow). GFP-hTalin-labeled MFs are false-colored red. The DIC image from C is false-colored green. Chlorophyll fluorescence is false-colored blue. Bars: 5 μm. Time-lapse images of stromules in dark-grown hypocotyl cells expressing GFP-hTalin revealed a complex relationship between MFs and stromules. A number of different types of interactions were observed between stromules and MFs. In many cases, stromules appeared to be anchored to thick, stationary MFs that were aligned with them. Immobilization of stromules by MFs is illustrated in Figure 4 and Time-Lapse Movie 1 Additional file: 1 where the bottom half of a stromule is associated with thick MFs while the top half is not. The bottom half remains fixed in position throughout the 3 minute observation period. This lower region of the stromule often appears bounded on both sides by parallel MFs (Fig. 4F). 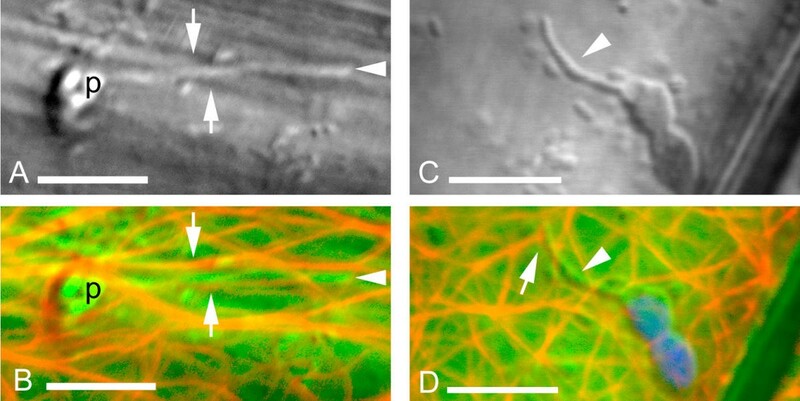 Interactions between microfilaments and stationary stromules A-E) Time-lapse images of a plastid with stromule in dark-grown hypocotyl epidermal cells. The junction between the plastid body and the stromule is marked by arrowheads (A-E). Images were taken at 8 second intervals. GFP-hTalin-labeled MFs are false-colored red. DIC images are false-colored green. F) Outlines of plastids and MFs in images A-E. Outlines are color coded according to time. Red: t = 0 sec. Yellow: t = 8 sec. Green: t = 16 sec. Blue: t = 24 sec. Violet: t = 32 sec. Arrows indicate the pivot point of the stromule where it interacts with the associated MFs. Bar: 5 μm. The top half of the stromule shown in Figure 4, which includes the plastid body, appears to be unattached to thick MFs. This upper region of the plastid moves around rapidly in the cytoplasm. It should be noted that the stromule appears to pivot at its midpoint (arrows, Fig. 4). This pivot point is the last point of attachment of the stromule to the MF, supporting the theory that MFs stabilize stromules. DIC images (green backgrounds, Fig. 4) reveal that clusters of small vesicles or organelles collide with the untethered region of the stromule and plastid body. Movement of these small bodies may be mediated by MFs: a diffuse GFP-hTalin signal can be seen within the clusters. Collisions with these vesicles may promote the movement of the unbound stromule and plastid body. On the other hand, diffuse GFP-hTalin signal, likely an indicator of very fine MFs, is also occasionally observable on the stromule as it interacts with the moving vesicles. These transient MF-stromule interactions may therefore be responsible for the observed stromule movement. Thick MFs were also found to be associated with rapidly moving plastids and stromules. In Figure 5 and Time-Lapse Movie 2 Additional file: 2, a plastid with stromule drifts from left to right across the image plane (arrows, A-H). The plastid body is in close contact with two thick MFs that bound it on either side and intersect at the tip of the plastid body (arrowheads, E-H). As the plastid body moves across the cell, the intersection point of the associated MFs also translates across the cell. Thus there is a tight correspondence between movement of MFs and plastids and stromules. In the example presented in Figure 6 and Time-Lapse Movie 3 Additional file: 3, rearrangement of MFs is associated with changes in the morphology and cellular position of a plastid and stromule. The plastid body (arrowheads, A-L) is attached to a long, thick stromule that appears to be anchored in the cytoplasm at the left edge of the image (A&G stars). Over time, the plastid and stromule are drawn back towards this anchor point, eventually passing it. Movement of the plastid body and stromule is marked by a prominent deformation of the stromule (Fig. 6G,6H,6I,6J,6K,6L, arrows), as if there were a discrete point along the stromule at which the force for movement were being applied. A thick MF intersects the stromule at exactly this deformation point, suggesting the MF may provide the force for pulling the stromule back. At one point, the morphology of the plastid body is altered dramatically (Fig. 6I,6J, arrowheads). This change in plastid shape is accompanied by a similar rearrangement of the MFs in contact with the plastid. These observations confirm that MF rearrangements and alterations in plastid and stromule morphology occur in parallel. Rearrangements of microfilaments are associated with stromule movement Time-lapse images of a plastid with stromule in dark-grown hypocotyl epidermis. Images were taken at 25 second intervals. A-D) DIC images show a plastid body drifting from left to right across the cytoplasm (arrows). While the plastid's net displacement is to the right, it stutters back and forth along its course. 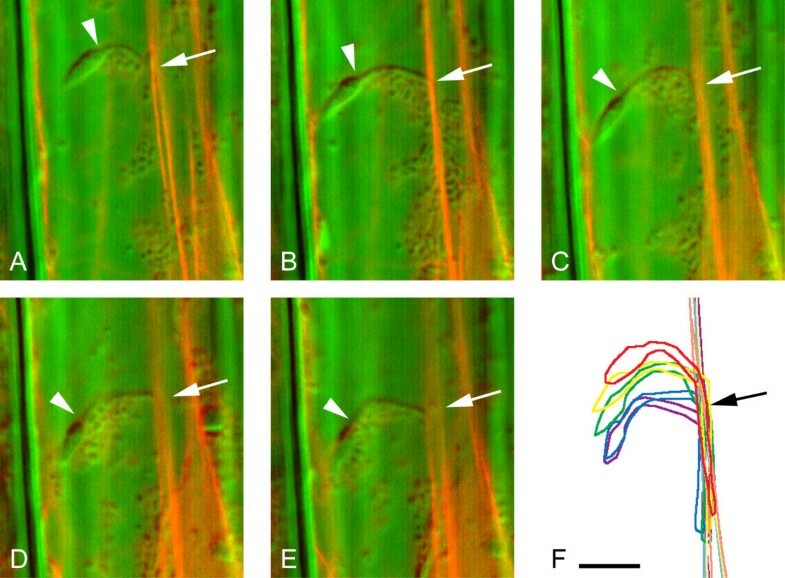 E-H) Fluorescence micrographs corresponding to A-D, respectively, indicate MFs interacting with the moving plastid and stromule. Two thick MFs bound the plastid body on either side (arrowheads, E-H). GFP-hTalin-labeled MFs are false-colored red. DIC images are false-colored green. Bar: 5 μm. 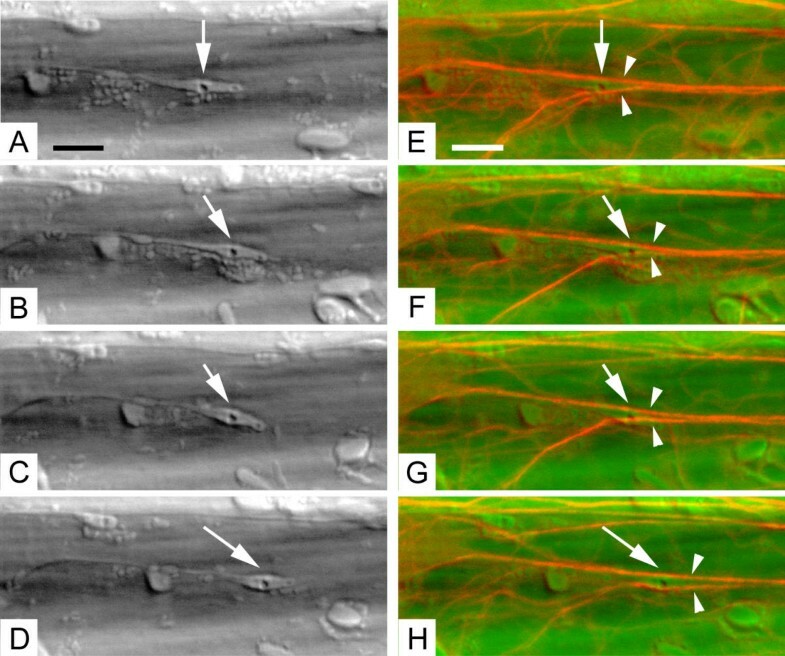 Rearrangements of microfilaments are associated with changes in stromule morphology A-F) Time-lapse images of a plastid and stromule in dark-grown hypocotyl epidermis taken at 15 second intervals. GFP-hTalin-labeled MFs are false-colored red. DIC images are false-colored green. G-L) Outlines of plastids (colored) and MFs (gray) from images in A-F, respectively, showing stromule-MF interactions. Arrows denote intersection of MFs and stromule-deformation point (See Results). Arrowheads denote the plastid body. Bar: 5 μm. Observation of GFP-hTalin Arabidopsis indicated a direct interaction between MFs and stromules, particularly with regard to movement of the two structures. We next set out to determine if the MFs involved in plastid dynamics were also utilized by other organelles such as mitochondria, which have been shown to move along MFs. DIC images often revealed small round or rod-shaped structures colliding with and sometimes running along stromules (Fig. 4). However, it was impossible to identify these small organelles based on DIC images. To better discriminate organelles, Nicotiana tabacum expressing fluorescent proteins in both mitochondria and plastids were observed. Dual-labeled tobacco plants were generated by crossing plants expressing plastid-targeted cyan fluorescent protein (CFP) to plants expressing mitochondrial-targeted GFP. Offspring of these crosses carried two fluorescent markers that could be separated with careful choice of fluorescence detection channels. Observation of hypocotyl cells revealed colocalization of stromules and mitochondria (Fig. 7). Circular mitochondria could be observed scattered through the cell cortex, but often were found in close contact with stromules and plastid bodies (Fig. 7A). Time-lapse images showed that mitochondria could move along the length of stromules, suggesting the two organelles might be in association with the same MFs (Fig. 7B,7C,7D,7E and Time-Lapse Movie 4 Additional file: 4). Mitochondria associate with plastid stromules in hypocotyl epidermis Tobacco expressing plastid-targeted CFP and mitochondrial-targeted GFP were imaged with confocal microscopy in light-grown (A) and dark-grown (B-E) seedlings. 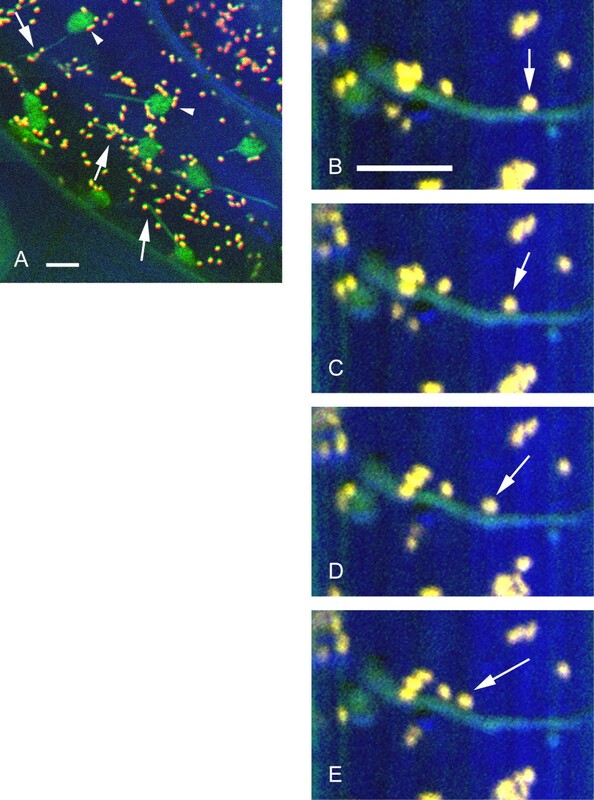 CFP-labeled plastids are false-colored green. GFP-labeled mitochondria are false-colored red. DIC images are false-colored blue. Mitochondria appear yellow due to bleed through of GFP into the CFP detector. A) Mitochondria line up along stromules (arrows) and plastid bodies (arrowheads). B-E) Time-lapse images of a mitochondrion moving along a stromule (arrows). Images were collected at 19.5 second intervals. Bars: 5 μm. GFP-hTalin proved to be an excellent label for investigating the interaction between MFs and stromules. GFP-hTalin-labeled MFs in hypocotyl epidermis resembled those reported by groups using GFP-mouseTalin [13, 15]. GFP-hTalin-labeled MFs were observed to interact directly with chloroplasts in light-grown hypocotyls. Thick MF bundles often surrounded chloroplasts in the cortex of cells, forming basket-like structures similar to those seen in immunolocalization studies . Observation of stromules in the GFP-hTalin plants at high magnification revealed a complex interaction between plastids and MFs. The majority of stromules were found in direct contact with fine and thick MFs (Fig. 2, 3, 4). MFs define the limits of stromule structure, often bounding the stromules on many sides or else forming a meshwork sheath around stromules. In some cases, MFs appear to interact with stromules in passing; that is, a stromule will make contact with a short region of a much longer MF. In other instances, MFs appear to terminate directly on the surface of stromules. Direct interaction between MFs and stromules is supported by observation of stromule dynamics in the GFP-hTalin plants. Rearrangement of MFs in close contact with plastids and stromules was associated with altered morphology of the organelles. This relationship between MFs and plastid and stromule morphology supports inhibitor data that showed that stromule length was sensitive to actin inhibitors Cytochalasin D and Latrunculin B .
MFs were also found to be associated with plastid and stromule motility. We observed motile plastids and stromules that were associated with actively moving MF bundles. Conversely, we also observed cases where attachment to MFs appeared to stabilize regions of plastids whose more distant, unattached regions were actively moving. Movement of unattached stromules could be due either to collisions with vesicles moving in the cytoplasm or by transient association with very fine MFs. Our observations suggest that MF rearrangements may actually cause the movement of plastids and stromules through the cytoplasm. This theory is in agreement with results from a previous study that showed sensitivity of stromule and plastid movement to actin inhibitors . Organelle movement in general in higher plants appears to be actin-dependent. Motility of Golgi stacks, mitochondria, and peroxisomes is dependent on MFs [16–21]. We were able to observe mitochondria moving along stromules, perhaps along a MF that was also in direct contact with the stromule. Stromules may therefore make use of a general organelle motility apparatus in plant cells. Thus, MFs have a complex role in relation to plastid structure and motility. A model of direct activity of MFs on plastid morphology and movement would predict the presence of actin binding proteins on the surface of plastids to join the outer envelope membrane to the MF network. Proteins similar to spectrin, α-actinin, and integrin, which have roles in anchoring of MFs to membranes, have been identified in plants based on sequence similarity and cross-reactivity of antibodies [22–24]. In addition, plants contain a large gene family of myosin motor proteins that are highly specific to plants . Immunolocalization studies suggest myosins may be present on the plastid envelope. Antibodies raised against bovine myosin bind to the surface of amyloplasts isolated from pollen tubes of the grass Alopecurus pratensis . Future research should be aimed at identifying the proteins on the surface of plastid membranes that mediate the interaction between plastids and MFs. Cytoplasmic MFs make direct physical contact with plastids and stromules in hypocotyl epidermal cells. Our observations of MFs in vivo are consistent with our previous observations of loss of stromule morphology and motility in the presence of MF inhibitors. We found that rearrangements of MFs were associated with changes in both plastid morphology and motility. MFs also appear to stabilize stromules and plastids within the cytoplasm. Our results reveal a complex relationship between MFs and plastids, and suggest that proteins that can mediate the interaction between MFs and membranes are likely to be found on the plastid outer envelope membrane. All plants were grown on Murashige and Skoog media with Gamborg's vitamins [Sigma, St. Louis, MO, USA, [27, 28]] supplemented with 30 g l-1 sucrose and 8.5 g l-1 agar. Seedlings were grown in sterile petri dishes at 21–25°C. Transgenic Arabidopsis thaliana expressing GFP-hTalin were generously provided by Adrienne R. Hardham . Transgenic Nicotiana tabacum expressing plastid-targeted CFP and mitochondrial-targeted GFP were generated by crossing stable nuclear transformants. The plastid-targeted CFP line expressed a fusion between the small subunit of Rubisco of Pisum sativum (RbcS-3A) and CFP [29, 30]. The Rubisco coding region includes an amino-terminal plastid transit-peptide. The mitochondrial-targeted GFP line expressed a fusion between the transit-peptide of cytochrome oxidase IV of yeast and an S65T mutant of mGFP4 . Observations were made on 3- to 5-day old seedlings whose hypocotyls were cut and mounted in water. Confocal microscopy was performed on a Leica DMRE-7 (SDK) microscope equipped with a TCS-SP2 confocal scanning head (Leica Microsystems Inc., Bannockburn, IL, USA). Images were collected with a Leica 100 × HCX PlAPO oil immersion objective (NA = 1.40). For GFP-hTalin imaging, GFP was excited at 488 nm, and emission was detected between 500 and 600 nm. Chlorophyll was excited at 633 nm and emission was detected between 660 and 700 nm. DIC images were generated from transmitted laser light. Because the blue channel in RGB images provides less resolution than either the green or red channels, the red and green channels are used in the figures for false-coloring the most critical features in each image. Thus, the false-coloring scheme is not identical in different figures. For still imaging of GFP-CFP plants, sequential scans optimized for each fluorophore were collected separately and then recombined with Adobe PhotoShop (Adobe Systems Inc., San Jose, CA, USA). GFP fluorescence was collected as described above while CFP was excited at 458 nm and emission was detected between 465 and 500 nm. For time-lapse imaging of GFP-CFP plants, both fluorophores were excited with a single pass of 458 nm light. Emission was collected as described for the still images. Dual imaging of GFP and CFP did not provide perfect separation of the two fluorophores because of overlap between the two emission curves. In particular, GFP fluorescence commonly bled into the CFP detector. However, very little CFP signal bled into the GFP detector. Therefore, it was possible to separate the two fluorophores by false-coloring the two channels and overlaying them. When CFP images were false-colored green and GFP images were false-colored red, plastids expressing CFP appeared green while mitochondria accumulating GFP appeared yellow because of the combined red and green coloring. The authors would like to thank Adrienne R. Hardham for the Arabidopsis plants expressing GFP-hTalin. This work was supported by a grant to M.R.H. from the Energy Biosciences Program of the United States Department of Energy (DE FG02-89ER14030). E.Y.K. received support from a grant to the NSF/DOE/USDA Cornell Training Group in Molecular Mechanisms of Plant Processes. EYK carried out microscopic observations and drafted the manuscript. MRH conceived of the study, participated in its design and coordination, and edited the manuscript. Both authors read and approved the final manuscript.